Are you in the process of examining and screening radiation therapy schools? Trying to determine if this vocation is for you? Wondering which school is best to bolster your career? Let’s examine the facts, figures and the future. Healthcare is being completely transformed by a medical treatment known as Radiation Therapy. It has become one of the most prevalent forms of treatment for individuals battling cancer. It is no secret that the thought of having cancer can strike paralyzing fear in the average person. In times past, being diagnosed with cancer meant certain death. However, with all of the recent advances in medical science, these prognoses no longer make the masses quite as fearful; nor do they automatically have fatal consequences. With today’s medical advancements, there is hope. Radiation Therapy is one of the main reasons for this. Who are the men and women behind this revolution in how cancer is treated and cured? They are Certified Radiation Therapists. Virtually, every single day, these dedicated therapists are saving lives and giving patients and their family reasons to be optimistic about the future. However, the success that this treatment has ushered in, has resulted in another enormous problem. Hospitals and cancer treatment centers across the nation have been left with a vacuum that needs to be filled; there are simply not enough Certified Radiation Therapists to meet the current demand. Most noteworthy, few people in the medical field anticipated this void. It was widely assumed that there would be a large influx of students enrolling in Radiation Therapy Schools. The belief is that after receiving their certifications, they would make their way into careers and this profession would always be manned. However, that hasn’t happened thus far. Why aren’t more qualified men and women looking into this gratifying field? A lot has to do with misinformation concerning radiation therapy schools and this career overall. First of all, acquiring a radiation therapy certification is not for those who do not value education. The Radiation Therapist Education Requirements are tough. But, as with anything of value, the reward far exceeds the time, money and effort one would need to put forth. The misinformation surfaces when potential students are convinced that this is just another boring job, not worth the educational investment. Nothing could be farther from the truth! Another aspect of misinformation is the time required to become certified. Typically, an Associate’s Degree, (which you can acquire in two years) will provide you with the schooling you need to become certified. As a result, you don’t need to spend four years preparing for your career. Nevertheless, as with most medical careers, there will be CE, Continuing Education that you may be required to participate in. Be advised, that is par for the course in this career path. Also, there are some programs that allow students to get certified in 1-year, but they are not really recommended. Are Jobs Available In This Career Field? The above sites only represent a small percentage of the sources that post jobs in this career field. As you will learn, there is an endless list of openings. The final aspect of misinformation relates to the pay. Like any other source of distorted truth, it is hard to determine where these low paying rumors started. 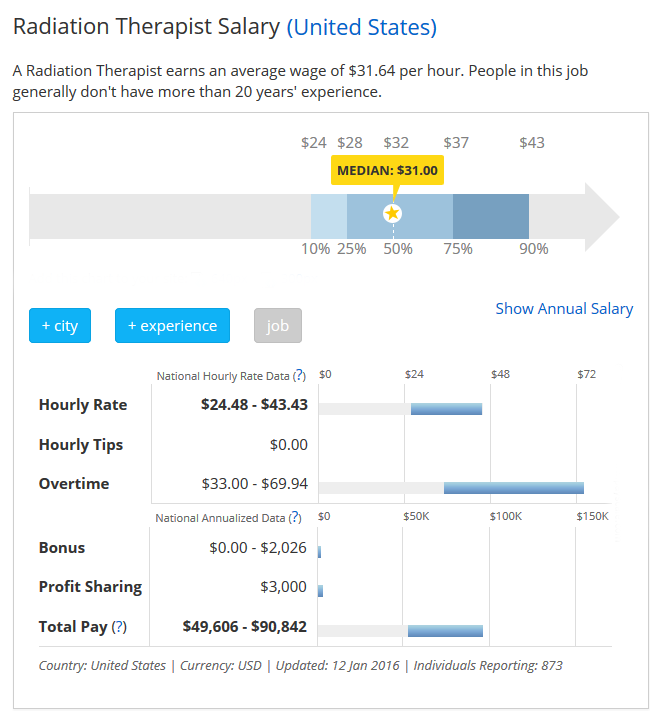 Let’s take a closer look at certified therapists and what their average earnings are. 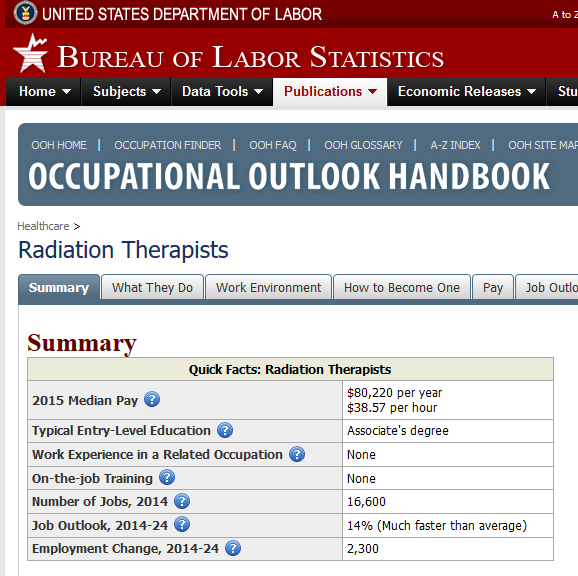 What is the average pay for Radiation Therapists? It is fairly common for certified and skilled Radiation Therapists to earn around $90K per year. That isn’t too bad when you consider the fact that many Radiation Therapy Programs only take one or two years to complete. The 1-year programs provide graduates with a diploma or certificate, while 2-year programs result in students earning an associate’s degree in addition to being certified. Although certification is not required, Certified Radiation Therapists are really preferred by employers. You will be well on your way after you have passed a recognized national exam that verifies your professional knowledge and skills. The American Registry of Radiologic Technologists (ARRT) is the most widely recognized of all the certifying bodies. Their certification system is very straightforward. In order to become certified by this body, a radiation therapist will be required to meet clinical competency and education standards that the ARRT has set. In the overall scheme of things, all of the quality Radiation Therapy Schools start to prepare you for easily getting through the exam from the first day you start to take their classes. There are basically two major ways that this highly prized certification can be obtained. One of the two following criteria must be met by radiation therapists in order to qualify to sit for the certifying body’s national exam. An accredited training program must have been completed by the applicant. The applicant must have worked full time for at least two years as a Radiation Therapist. What is the Current Employment Outlook For Individuals Who Graduate From The Better Radiation Therapy Schools? It has been projected that employment for radiation therapists will grow by an amazing twenty-seven percent starting with the year 2008 through the year 2018. Those statistics come directly from the Bureau of Labor Statistics. There is one conclusion that these statistics directly point to: which is that the demand for the career field of radiation therapy is growing much more rapidly than the average growth for a majority of many other occupations. Radiation treatment is administered to patients by radiation therapists in accordance with the instructions and guidance provided by radiologists and oncologists. The teams work together closely with cancer patients, to get them prepared for therapy in addition to keeping track of both their mental and physical development following therapy. Radiation therapists identify and find growths, update and maintain treatment records and calculate the amount of radiation. Most important of all, they comply with all regulated specifications when it comes to safeguarding patients as well as providers from excessive dosages of radiation. The position of Certified Radiation Therapist is a fast-growing career field with expanding job opportunities, high salaries and rewarding careers. If you need more information as you’re sifting through the numerous radiation therapy schools, or if you need other input, use our search feature; we more than likely have already answered your questions.